If you want your get out of debt plan to succeed, your plan to pay off your debt must be realistic. Otherwise, you will fail and end up feeling bad about yourself, when the goal was unreachable, to begin with. Before you set a debt-free goal, take time to understand the reasons you want to get out of debt. What is your motivation? What do you want to accomplish by getting out of debt? Not wanting to owe anyone is a no brainer, but why don’t you want to owe money to anyone. Is it putting a hardship on your finances? Is it keeping you from reaching your ideal retirement savings? Really think hard about why you want to pay off your debt. Once you’ve come up with your reasons for paying off debt, write them down. “I want to be debt free because…” or “I want to be debt free so I can…” Put your list of reasons in a place that you will see it all the time. This will help keep you motivated even when you feel like giving up. It puts your end goal right in front of your face. Reaching your debt-free goal is all up to you. The statements come in your name. The debts are on your credit report. 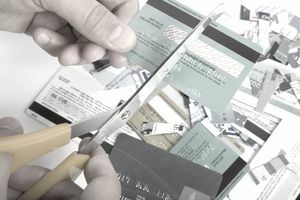 Getting rid of your debt comes down to you. When it comes to getting out of debt, the (seemingly) easiest answer is to pay it off. But, you may consider some other options, like enrolling in consumer credit counseling, settling with your credit card issuers, or even filing bankruptcy. These may not be the most ideal options and there may be some drawbacks to each option, but they are all worth serious consideration. Figure out how much can you afford to spend paying on your debt each month. This may require you to scale back in some areas of your life. You may even have to work some extra hours. Perhaps you have a hobby you can make money from on the side. There are plenty of options, but it’s up to you to explore them and make them happen. The amount of time it takes you to become debt free is directly related to the amount of money you can put toward your debts. The more you can pay, the sooner you can be out of debt. This is where being reasonable really comes into play because an unrealistic timeline that’s difficult to meet, can kill your debt free plan, leaving you disappointed and unwilling to try again. Unrealistic goal: Pay off $15K in credit card debt in 1 year on a $50K/year salary and $1100 mortgage. If you can manage to pay $2,700 on your credit card each month, you can make it happen. Realistic goal: Pay off $15K in credit card debt in 3 years by cutting back and making a $500 monthly payment. This is definitely more reachable. There are many online debt payoff calculators that tell you how time it will take to pay off your debt based on the amount of money you can afford to pay. Some of them even let you enter several debts. Or, you can reverse it and figure out what monthly payment it will take to get out of debt within a certain period of time. Paying off your debt is never as simple as racking it up. It could take several years to pay off your debt. Know that upfront and it won’t be so shocking when you enter your second and third years of debt repayment. Stay motivated by keeping your debt motivation notes up-to-date and in front of your face. Track your debt progress. Update your balances, amount paid to date, and the amount left until payoff. Seeing your progress will keep you from feeling like you’re not getting anywhere.